As the dragon, a benign and auspicious creature, symbolizes the Emperor, the fenghuang, a composite of several different real birds representing the ultimate bird, became the symbol of the Empress. The motif of dragon and fenghuang was also auspicious, creating a rebus longfeng chengxiang ("the dragon and fenghuang present auspiciousness"). Because of this symbolism, the combination was commonly used on gifts and paraphernalia at weddings. Four-clawed dragons were produced by the Court to be distributed to the ennobled, entitled to the emblem, whereas a five-clawed dragon would have been reserved for an Imperial wedding. The combination of fenghuang and bamboo (zhu) stand for abundance (fengzu). The rocks and waves provide another reference to popular aspirations. The rocks stand for mountains (shan) and the waves represent the sea (hai), and together express a wish for the immortality of the Southern Mountains, and happiness as vast as the Eastern Sea. Both narrow sides are carved with bats suspending shou characters as well as eternal knots, one of the Eight Buddhist Symbols, reinforcing the idea of longevity. 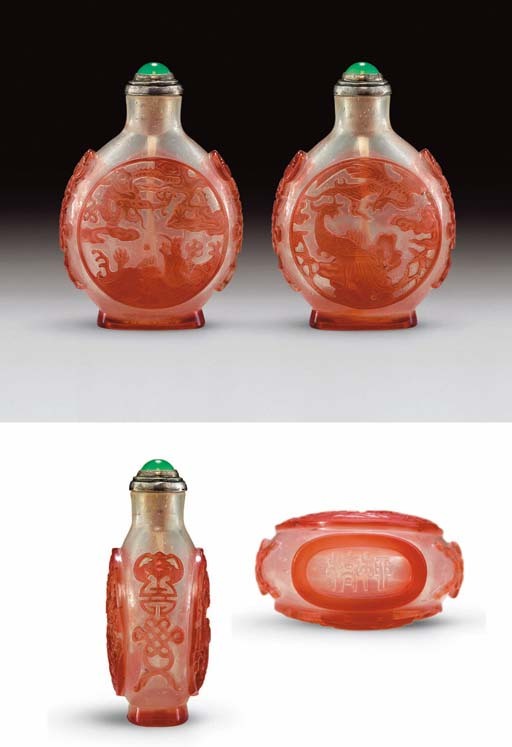 A red overlay bubble-suffused glass snuff bottle of very similar form, also with a circular panel of decoration, is illustrated by Moss, Graham, Tsang, The Art of the Chinese Snuff Bottle. The J & J Collection, no. 364.